We are busy getting ready for the Birds Of Prey Fundraiser coming up this Saturday, Feb 17 at 7 p.m. at the Celtic Junction. Here is a link to the silent auction items we have so far.....take a look! You can bid online or better yet, come and join the fun, hear the speakers, have a glass of wine or a beer. Here it is....all the 2017 results! There were 214 chicks that were known to have fledged successfully or survived to fledging age! (208 in 2016). Most successful nests had two to three chicks. (44 nests with two chicks, 37 nests with three chicks, and 15 nests that only produced a single chick). The mortality rate this year was similar to last year with 19 chicks which were known to have died or disappeared before fledging,(18 last year) with five nests that failed before we were able to see or accurately count chicks. Two adult Ospreys were known to have died and one adult disappeared midseason and was presumed to have died. 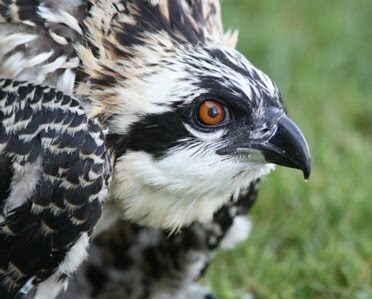 There were 99 adult Ospreys which were identified by their bands. Two of these were from Iowa. We located 13 new nesting territories, including two nests that were discovered this year, although reports indicated that they had been there for one or more years. Only five of these new nests successfully fledged chicks. Eight banded Ospreys were believed to have bred successfully for the first time and their average age was 4.50 years old. (Average age of first successful breeding for males this year was 5.25 years and for females it was 3.75 years). It is interesting to note that of the 132 occupied territories this year, 74 were on osprey nesting platforms, 20 were on cell or radio towers, 18 were on ballfield lights, 17 were on a power pole or transmission tower, and 3 were on other manmade structures. One nest was built in a dead tree in late 2016, but only a single osprey was seen there sporadically in 2017. Two osprey nests were taken over by geese and one by a Great Horned Owl this year. The overall productivity of occupied nests which were successful this year was 72%, (76% in 2016, 68% in 2015, 70% in 2014, 67% in 2013, and 77% in 2012). The mean number of young fledged per successful nest was 2.25 (2.24 in 2016, 2.43 in 2015, 1.77 in 2014). The mean number of young fledged per active nest was 1.75 (1.84 in 2016, 1.88 in 2015, 1.41 in 2014) and the mean number of young fledged per occupied nest was 1.62 (1.70 in 2016, 1.65 in 2015, 1.25 in 2014). These numbers reflect a slight decrease in overall productivity per nest, although the number of chicks fledged per successful nests remained similar to last year. The cluster of ten nests which all failed within a small area in 2015 (approx five mile radius), and had seven nests fail in 2016, did better this year, with only four nests failing. Three of those nests failed after hatching was observed, with the timing of failure unknown on the fourth nest. Two nests in that cluster have failed for three years in a row. Weather did have an impact this year, with 6 nests along the northern tier of the study area blown down during large storms in June and July. There were three additional nests where one or more chicks were blown out of the nest in these storms, although at least one chick survived. On one nest the adult female took a beating and was buried in six inches of hail. Two of her chicks were lost, but she somehow managed to protect one chick which survived and fledged. The most interesting behavior documented was a male whose mate disappeared, and presumably died, who took over the care and feeding of three small 3-4 week old chicks as a single parent. He heroically balanced the hunting, feeding and sheltering of these young birds, which all fledged successfully, although one of the chicks was subsequently electrocuted when it landed on a power pole. The oldest male on record, at 23 years of age, returned and bred successfully, raising two chicks to fledge. This is the oldest bird to breed successfully in this 34 year study. Two additional older males, 18 and 17 years of age, also bred successfully. Our oldest females are quite a bit younger with four 10 year olds that all bred successfully. *Successful nests are those that were known to have fledged at least one chick successfully, active nests are those where eggs are laid and occupied nests are those where pairs are present at a nest site for a period of time, regardless of the time of year or whether or not they lay. Any use or reproduction of this data should be appropriately credited to Vanessa Greene at Twin Cities Metro Osprey Watch. A reminder that I will be speaking at the Raptor Resource Project’s annual fundraiser on Feb 17, 7 p.m. at the Celtic Junction in St Paul! Funding will be for several raptor related projects....come and join us for a fun evening of speakers, great music, including the Brian Boru Pipe Band (awesome!) and have a glass of wine or a beer and bid on some of the silent auction items. A good time for all and a chance to chat with some interesting folks doing important work with these raptors we love so much! Well, here it is, February 2018 already! I have been working hard thru January to gather together all the data collected in 2017 and to organize and analyze it all. I would like to start with sharing the oh so important acknowledgments of all the people who have pitched in to help with this project. I am still proof reading all the overall results and will post that soon as well. There are so many people who have been instrumental in helping Twin Cities Metro Osprey Watch continue this Osprey research. This year, 2017, marked my 24th year of monitoring all known nests in the eight county metro area surrounding the Twin Cities of Minneapolis and St Paul, and I could not do this without a great deal of help. The careful, monitoring of these nests and the consistant collection and analysis of data over so many years may prove to be a significant contribution to understanding the world we live in, the health of our environment as well as overall productivity and behavior of this population of Ospreys. Special thanks to Alice Stoddard, Barb Ankrum, Grace Pass, Faith Christine, Margaret Wurtele, Phyllis Bofferding, Carol Christians, Janae Herman, Perry Westphal, Larry Waldhauser, Allie Gebauer, Elizabeth Closmore, Erik Gulsvig, Dani Porter Born, Barbara Gaughan, Carol Reitan, Cheri Fox, Susan Rego, Kristi H., Karen Connolly, Meg Smith, Sid Stivland, David Schranck, Jean and Rod DeZeeuw, Mike Lehrke, Judy Englund, Jeff Moravec, Jo Bolte and Ellie Crosby, for sharing their observations, their commitment to this effort, their photos, and their love for these birds. Thanks to all the private property owners who are such important and wonderful hosts to our Ospreys, and who have provided me access to these nests for monitoring.Special thanks to Tim Fenstermacher at Aggregate Industries for his cooperation in allowing me to monitor nests on their property. A very heartfelt thanks to Cathy Gagliardi for initiating the Go Fund Me page to help with donations to support this project. Thanks to all who contributed…Barbara Pierson and Paul Patton, Carol Craig, Carol Fischenich, Judy Layzell, John Zakelj, Cheryl Batson, Carol Cummins, Sally Heuer, Mary Savina, Jeff Moravec, Roslynn Long, Perry Westphal, Frank Taylor, Pat Norton, Alex Doan, Barb Ankrum, Karen Nemchik, Dani Porter Born, Jim Podlich, Ellie Crosby, Robert Van De Loo, Gail Ireland, LaVonne Wathen, Meg Smith, and of course Cathy Gagliardi! I also want to send a deep thanks to John Howe and John Dingley at the Raptor Resource Project for including me in their annual fundraising effort and for their generous financial support. I am deeply grateful for all the help I have received in so many different forms, and for showing your faith in my ongoing efforts to continue this research study.